Enjoy a glass of wine on arrival whilst settling in to this entertaining afternoon. Share a reading, a review, or your own writing (up to 5 minutes per speaker) or just relax and enjoy listening. 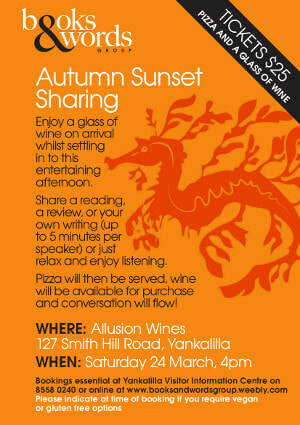 Pizza will then be served, wine will be available for purchase and conversation will flow!